CollisionWorld is interface and container for the collision detection. Definition at line 88 of file btCollisionWorld.h. Definition at line 70 of file btCollisionWorld.cpp. Definition at line 79 of file btCollisionWorld.cpp. Definition at line 139 of file btCollisionWorld.cpp. Definition at line 238 of file btCollisionWorld.cpp. contactTest performs a discrete collision test between two collision objects and calls the resultCallback if overlap if detected. Definition at line 1308 of file btCollisionWorld.cpp. contactTest performs a discrete collision test between colObj against all objects in the btCollisionWorld, and calls the resultCallback. contactTest performs a discrete collision test against all objects in the btCollisionWorld, and calls the resultCallback. Definition at line 1296 of file btCollisionWorld.cpp. convexTest performs a swept convex cast on all objects in the btCollisionWorld, and calls the resultCallback This allows for several queries: first hit, all hits, any hit, dependent on the value return by the callback. Definition at line 1130 of file btCollisionWorld.cpp. Definition at line 1375 of file btCollisionWorld.cpp. Reimplemented in btDiscreteDynamicsWorld, btMultiBodyDynamicsWorld, btDynamicsWorld, btSimpleDynamicsWorld, btSoftMultiBodyDynamicsWorld, and btSoftRigidDynamicsWorld. Definition at line 1557 of file btCollisionWorld.cpp. Definition at line 125 of file btCollisionWorld.h. Definition at line 130 of file btCollisionWorld.h. Definition at line 494 of file btCollisionWorld.h. Definition at line 499 of file btCollisionWorld.h. Definition at line 165 of file btCollisionWorld.h. Definition at line 141 of file btCollisionWorld.h. Definition at line 146 of file btCollisionWorld.h. Definition at line 509 of file btCollisionWorld.h. Definition at line 514 of file btCollisionWorld.h. Definition at line 519 of file btCollisionWorld.h. Definition at line 443 of file btCollisionWorld.h. Definition at line 135 of file btCollisionWorld.h. objectQuerySingle performs a collision detection query and calls the resultCallback. It is used internally by rayTest. Definition at line 634 of file btCollisionWorld.cpp. Definition at line 644 of file btCollisionWorld.cpp. Definition at line 244 of file btCollisionWorld.cpp. rayTest performs a raycast on all objects in the btCollisionWorld, and calls the resultCallback This allows for several queries: first hit, all hits, any hit, dependent on the value returned by the callback. Reimplemented in btSoftMultiBodyDynamicsWorld, and btSoftRigidDynamicsWorld. Definition at line 1052 of file btCollisionWorld.cpp. rayTestSingle performs a raycast call and calls the resultCallback. It is used internally by rayTest. In a future implementation, we consider moving the ray test as a virtual method in btCollisionShape. This allows more customization. Definition at line 308 of file btCollisionWorld.cpp. Definition at line 318 of file btCollisionWorld.cpp. Definition at line 110 of file btCollisionWorld.cpp. Reimplemented in btDiscreteDynamicsWorld, btSimpleDynamicsWorld, btSoftMultiBodyDynamicsWorld, and btSoftRigidDynamicsWorld. Definition at line 265 of file btCollisionWorld.cpp. 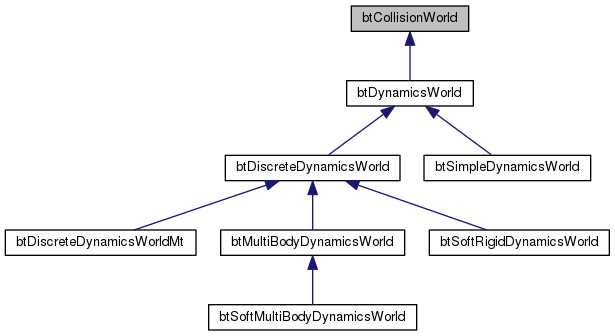 Reimplemented in btDiscreteDynamicsWorld, btMultiBodyDynamicsWorld, btSoftMultiBodyDynamicsWorld, and btSoftRigidDynamicsWorld. Definition at line 1706 of file btCollisionWorld.cpp. Definition at line 1653 of file btCollisionWorld.cpp. Definition at line 1685 of file btCollisionWorld.cpp. Definition at line 120 of file btCollisionWorld.h. Definition at line 160 of file btCollisionWorld.h. Definition at line 523 of file btCollisionWorld.h. Definition at line 219 of file btCollisionWorld.cpp. Definition at line 176 of file btCollisionWorld.cpp. Definition at line 100 of file btCollisionWorld.h. Definition at line 94 of file btCollisionWorld.h. Definition at line 102 of file btCollisionWorld.h. Definition at line 96 of file btCollisionWorld.h. Definition at line 98 of file btCollisionWorld.h. Definition at line 106 of file btCollisionWorld.h.